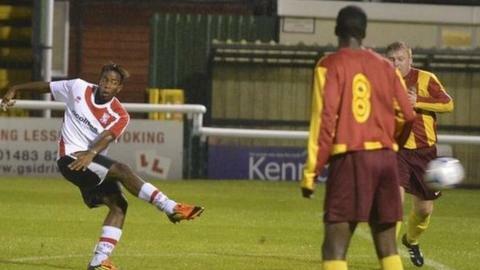 Woking have signed former Aldershot striker Reece Beckles on a two-year deal following a spell on trial. The 18-year-old has impressed manager Gary Hill during his time with the first-team and scored in their Surrey Senior Cup win over Walton Casuals. London-born Beckles was released by the Shots in May after they went into administration. "He's done really well and has shown his quality since he joined us," said director of football Geoff Chapple. "He's still very young but has all the attributes to become a fantastic striker. "Reece has shown great determination to make it as a professional and we will work with him and help develop his all-round skills in the next two years." Beckles will be included in Woking's squad for their clash against Conference Premier side Cambridge United this Saturday.